The “Find Loving Homes for Your Art” Seminar Series on Maui. Are you an Artist living on Maui? Are you struggling with marketing and online (and offline) sales? Do you just plain want to “Find Loving Homes for Your Art? Whatever medium you work with, there are tried and true ways to grow your sales. Many are easier than you might think! Join me, Mckenna, for an hour-long seminar held on the third Tuesday of every month at the Maui County Business Resource Center in the Maui Mall. Each month, a new topic will be brought to the artist community. Each one-hour session will have actionable and immediately useful hints and tips. Scroll to see the line-up of the first four topics! An in-depth look at the three essential elements needed to have a fully developed art business. The “Golden Triangle of Success” Is the foundation of all successful selling both online and in-person. It will help you create a structure from which you can easily put together effective plans for your success. It’s Marketing Magic Made Easy! In this world of online sales (and even offline, too) understanding the “Buyer’s Journey” means you will gain the trust levels needed for a purchase of your art. Without this understanding, your website and other selling material will result in lost opportunities and sales. In a world where people are now buying used cars online and taking delivery from vending machines (yes…you read that right! ), consumers are much more likely to buy art, too. However, there are certain marketing principles that are often ignored when putting a website together. As a professional website reviewer, I often see very expensive sites that are “designed” by web developers that totally miss essential parts that are imperative to online sales. There are methods and menus and more that all work together to move a visitor from curious to a collector. Once you have gained a basic understanding of the Golden Triangle of Success, the Three Stages of the Buyer’s Journey, and have “refreshed” your website to give your visitors an easy and excellent experience, it’s time to put all the parts to work. The “funnel” is the perfect visual to help you understand what you need to do to guide the experience of your collectors and would-be collectors into a system that encourages purchases. Converting interest into a purchase is the goal of everyone who has a website. This seminar will help you create the flow in your marketing plans that will increase your likelihood of a sale. JOIN MY LIST - Don't miss these seminars! The "Find Loving Homes for Your Art" Series Continues! This is a long list of possible subjects that I plan to bring to the Artist community here on Maui. In no particular order, these topics will be presented at the Maui County Business Resource Center every third Tuesday throughout 2019! Content Creation – Blogs, Emails, Social Media and more! 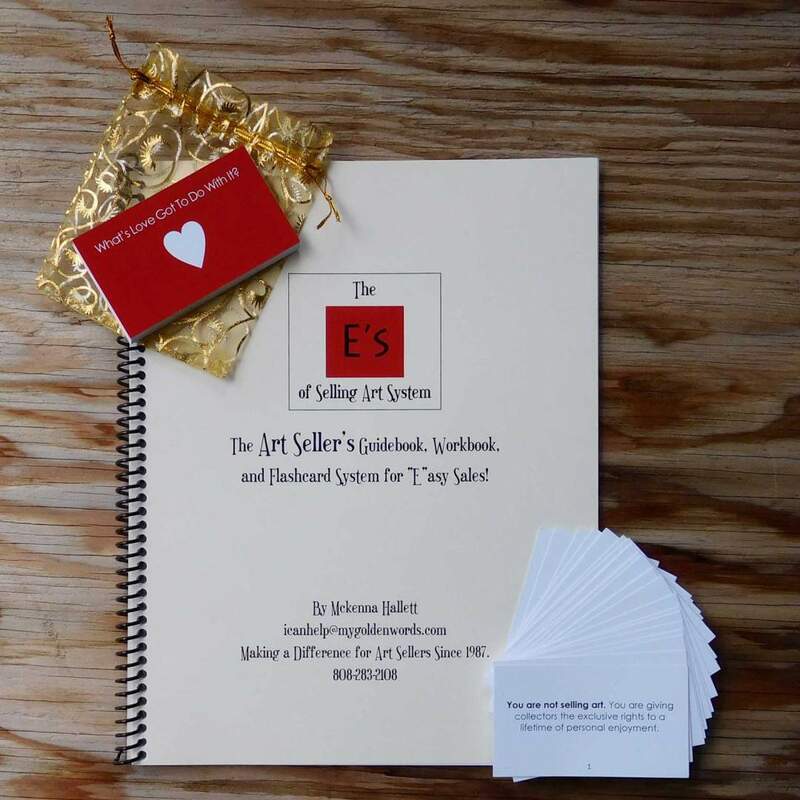 Can Wholesale Work for Your Art? It is my greatest pleasure and sincere desire to help you “Find Loving Homes for Your Art”. In fact, it feels like a responsibility to share my decades of experience. It’s a privilege and it’s my kuleana! If you are reading this and you don’t live on Maui, I am slowly building up online resources including eventually doing webinars to spread this information beyond my little island. If you want me to come and put together a half-day or full-day presentation, I do offer special rates for artist organizations. Email me and let’s brainstorm on a selection of topics that will bring your members the information they most want to explore. Wherever you are on the planet, please JOIN MY LIST. And feel free to reach out and email me directly anytime about anything! And don’t forget that you have instant access to a lot of terrific content here on my curated blog posts page and in my podcast over on Patreon. Learn more about Patreon and listen to some sample podcasts here. If you live on Maui, I look forward to seeing you, learning more about your art, your dreams, and your challenges or otherwise serving you and as many artists as possible.